The venerable Remote Desktop Connection Manager (RDCMan) 2.2 was starting to show its age. After a slight hiatus, RDCMan 2.7 is now available. Please say thank you to Julian Burger for the early Christmas present. Remote Desktop Connection Manager (RDCMan) is a great tool to consolidate multiple RDP connections into a single window to prevent desktop clutter. The tool can be obtained from the Microsoft download centre. I always keep my .RDG files in a subfolder of My Documents, which is a redirected folder to a file server. Finally and most importantly, please say a big thank you to Julian Burger the developer who wrote this and David Zazzo for working to get the tool released initially!! Finally! Thank you for this christmas gift! very cool! where do we go to report bugs and feature requests? Can I read help.htm on internet ? I want to share help.htm on Facebook/Twitter with our friends. Awesome, and I hope Japanese version of Remote Desktop Connection Manager, and help.htm. I want to share this with our Japanese friends. if you are finding issues let me know and I can provide the feedback Strict. Does it help if you run that through a translator? Full screen mode doesn’t work as previous version? The scroll bars are always visible. Why they move down Disconnect button??? Anyway, as Andy posted, there seems to be a problem with full screening that still worked in the previous version. What happens: the remote desktop doesn’t fullscreen properly, it doesn’t override the task bar so it remains visible and so the window won’t be large enough and scroll bars remain visible in a "bugged" state, however the RDCM UI disappears. Workarounds: if RDCM window is NOT maximized, this works as expected. Hope you can get this fixed, thanks. like clicking though a GUI wizard. I am guessing this broke when fixing "Shortcut keys didn’t work when focus was on a thumbnail." but I would really like to see this feature come back even if it is an option or a toggle. Select the Group you want to Interact with, or the top level if you want all of them. On the Display Tab, Make sure that “Allow Thumbnail Interaction” is checked. It is clear by Default. Logon credentials (password) from parent does not passthru to Windows 2012 client? This was one of the best feature I liked in RDCMan, and hoping to get this feature again :). This solves the 3334 error when connecting to n Windows Server 2012 servers? Thanks for the update! I’d like to repeat Miko Brown’s observation. Thumbnail doesn’t seem to allow you to interact any more is there a new setting I’m missing? and, just as in one of the other comments, ability to interact with the machines in thumbnail view. Ifiok: Ability to interact with machines in thumbnail view is still available: click on one’s title to connect. Is anyone knows, what encoding used by this version to encrypt stored passwords? Any idea on how to connect it to a vSphere console? I also have problem with scaling on the client area. It seems as if the desktops on the rdp sessions doesn’t always scale? The startscreen is scaling. Where can we send feedback or get in touch for some support? Interactive Desktop in Thumbnails – found out what I was missing. There is a new display option. Go to properties, Display Settings and make sure "Allow thumbnail session interaction is checked." Is there a way to change the location of the RDCMan.settings file? It is in %localappdata%, but I’d prefer the possiblity that it ‘roams’ with me. Full screen does not work correctly ((. The Full Screen has issues where if you maximize the session from a maximized server selection screen it oversizes the screen. If you restore down the first screen then full screen it sizes it correctly. I troubleshoot this further. The cause is the DPI. When I set Control PanelAppearance and PersonalizationDisplay to 100% (instead of 125%) undocking is fine. But because my large resolution I prefer 125%. I had this same problem. My Control Panel\All Control Panel Items\Display was set to Medium (Default). I had to change it to “Smaller” which is 100%. Wish they could fix it because everything is impacted to allow this to work. Otherwise awesome. Thank you very much. I use it every day and the new version has a lot improvements. Win2012 now works like a charm. Great new version. Small bug, when adding a smart group to a group (to do a Parent/Child relation) the smart group is not showing any servers. Click does not work on the thumbnail. I hope in the resurrection of the function. is it so hard for Technet to add Share buttons? pressing Share opens up e-mail! I’m sorry, I must be very stupid. I can’t make this thing work at all. I wish I could, I need the scaling capabilities to use with my 4K laptop running Win 8.1, needing to connect to Win 7 machines. The bigger problem is there isn’t any way to save a dialog. I can add a group, but that’s it. So I can’t add a server, etc. Ctrl-S does nothing from inside the dialog. Is there maybe some part of the GUI that’s not rendering? we could maintain a central definition of the servers to connect to. Currently every time I log out I lose my Global settings (including credentials) – is that because the app saves settings to %localappdata% instead of %appdata%, and we throw away the local settings at logout (we rely on roaming profiles instead)? Can this location be changed? Great tool though – a relief to see it being maintained again. windows session, rather than from the credentials specified in the group or server properites. Hi… thanks for the tremendous tool… Can we please please please have an inline search function? Otherwise, I have experienced no issues with the tool. But v2.7 seems to contain a problem. IPv6 addresses are no longer supported as it was in v2.2. When using a plain IPv6 address, a DNS lookup is attempted on the IPv6 address which of course fails. I love the fact that the tool is being developed again. in any way when sort order is set to "No sorting". It’s nice to have a feature to save specific credentials (profile) and reuse those not only by inheritance. Unfortunately I see no way to manage the saved credentials (profiles) – I can only create and use them, but can’t see a way to delete. One more thing: It’d be nice if we could get rid of the limitation that a group can only have other groups or servers and can’t mix those. That’s very inconvenient. One question to Julian Burger and the team: How do you obtain the session status and active user in the "list session" feature? I’m using this a lot in a self-scripted XP program but for many of the RDP-sessions I get status "Unknown". A tip or comment on this would be very much appreciated. Thanks. New feature suggestion: List sessions for all connections in a group. In 2.2 there was an option to "Store password as clear text". Now that this is gone I am unable to share my .RDG between multiple VM’s. Is there a way to do this now? I liked the ability to update it once for multiple machines. form RDCManager for servers, where you use this as your logon account. This is great! So good to see this updated! Associate and I were just lamenting "gosh, it’d be nice if this was just a little updated, and didn’t crash as much as it does…" – one search later, and here we are! "This solves the 3334 error when connecting to n Windows Server 2012 servers?" I would be extremely happy to be able to see that fixed, but am happy it’s been updated with so many new features! Thank you! Really makes my day! Full screen mode doesn’t appear to actually be full screen. The host computers taskbar. Has anyone figured out how to fix this? RDP Manager is my favorite remote desktop tool!! @Derek G. see the workaround on page 1 of comments for the taskbar on full screen issue. If RDCMan is not maximized, then going full screen works properly. Not ideal, and better than nothing. on the server (and the microscopic text). Did a setting get moved, or is this a legitimate regression? I was very pleased to see the updated version, but I really miss the ability to save passwords as clear text. I use my .RDG file on multiple machines, and have it in a shared directory. This does not work anymore. I think I may be able to do it by using a certificate, but I have not been able to figure out how to do this yet. How can i disable the "Bitmap Cache" in this version? Would be nice to see the new "smart scaling" ability with RDCMan. in 4K screen. How do I fix this? thanks. Any know of a way to disable credsspsupport within rdcman 2.7? Hello, I have to concur, for high DPI displays (in my case 2560 * 1440 / 13"), the apparent lack of scaling is a clear regression, have to roll back to V 2.2. Or am I missing a setting somewhere? I launched 3 Remote Desktop Connexion manager and Fullscreen mode is useful in this case. So for the moment I continue to use version 2.2 for this need. I confirm also if RDCM window is NOT maximized, this works as expected. But I hope you can fix this problem. Another suggestion I didn’t use the ability to store a password as plain text, but sometimes I used this functionality to display current password (in order to verify if is up to date). I think it could be interesting to implement this functionality (just display not store password as plain text…). Feature add: I realy would like to have an hotkey to set my session fullscreen. You can go fullscreen using the menues "Sessoin -> Full Screen" but hotkey would be perfect. You can circumvent the IPv6 connection problem by using an entry in your hosts file. I successfully tested this. Many thanks for a timely update. It seems to do everything I need. I too used the "save pw in clear text" option to check things. Would be nice to add colors to the text. It would help distinguish one server from another. Was I foolish to expect this install to work without wiping out my existing RDG file, as it was situated in my default-settings install of RDCMan 2.2? Was that too much to ask, for an install process to preserve the settings of a previous version by default? Thank you for the update was crashing on 2012 servers and the green check on the selected machine is very nice, was hard to tell what server it was on before. Hi, thank you, Rhoderick, Julian and David for this fantastic tool. After trying it over RDCMan 2.2, if I may, I’d like to bring up an issue I faced which wasn’t there in 2.2. That is, in full screen mode, the remote desktop screen is covered by the taskbar of my pc. I’m running Windows 7 Entreprise 64bit. From memory, the settings in RDCMan 2.7 are "Display settings:Full screen" and under another tab, scaling for both dock and undocked are both ticked. I’ve tried several permutations to no avail. Also, would you point me in the direction of how I can list remote sessions successfully? Many thanks, and again, wonderful work! I like the feature which allows the RD to adjust the size to the client area size "Same as client area". However when I choose this option and I then go to Full Screen, the full screen is also only the size of the client area and not full screen. Is there a way to have a full screen in this case? When going full screen it keeps the resolution. It would be much nicer if it reconnected with the full resolution. and continue right away, without wasting time. Never mind… I just discovered the Reconnect Virtual Group. However, it would be nice to just be able to right-click on an existing server and select "Auto-reconnect" instead. Is it possible to specify /admin switch? networks. I had been able to modify and share a central rdg file but now every time I spin up a new vm I get "problems decrypting some credentials." Great tool but this is a step backwards. tab resulted in a warped look. Then a colleague pointed out the "Same as client area" option on the Remote Desktop Settings tab. I’m back to normal now and everything is right with the world. Thanks for the tool. Thank you! I’ve been waiting so long for this update. Any help with Connection Settings to start either a simple command prompt with a batch / script file or the start of Internet Explorer is appreciated – in the Start program I have IEXPLORE.EXE and the working directory C:Program FilesInternet Explorer. I agree with Jerry Cote. I was expecting that since this was an update, that all my servers and groups would still be present. After the upgrade, I got a blank page and have to re-enter all my servers I connect to. I have well over 40 servers that I connect to (hence the use of this tool) which I now have to remember the names of to reconnect to them. I suspect that the connection file was in the same location as the app Jim – is that correct? your connections will be lost…. but since I use a laptop with win8.1 with checkpoint VPN, I can’t use it anymore! now it doesn’t. Any ideas on how to re-enable this particular feature? became manually way to add 5 or more no of servers but in previously version its easy to add from txt file, if this option is brought back then it would be very useful. Worst tool. i am seeing client area size at 4 places. No clue which works. NO documentation. How can i change the screen size? I don’t want to scroll right and left. Trying to undock a windows on Windows 8.1 with display scaling enabled ends up throwing this exception. This doesn’t happen when I set the uncheck the flag on the app to disable legacy hi dpi support. First big Thankyou,Error 3334 is gone, but there are new Errors. I have .NET 4.6 RC installed and it crashes on startup. 🙁 Guess I’ll have to go back to 2.2 now. Where can I report this? boxes often have edges that disappear on a 4K screen, so you can’t hit ok or cancel. How do I fix this? thanks. To clarify: this occurs on every combination of windows 7 and windows 8.1 (all four combinations of remote and controller). It may be an issue with the "display settings" tab, "scale remote desktop" doesn’t seem to do anything. Ensure the hostname or IP you use is exactly as what’s stored in RDCMan. Disappointed that my migration from RoyalTs hasn’t been as smooth as I expected, but hopefully things will get fixed. So a few further cmoments: yes, Full Screen mode is not quite right; scrollbars! In undocked mode, the menu bar is wasting space and cannot be turned off. Undocking, maximizing, then reconnecting, doesn’t quite size it properly leaving scrollbars. Also found a problem whereby undocking then going full screen cuts a few inches of the viewable area of the remote session, and the right-hand-side vertical space that’s left behind is black. It would be nice to restrict the program to only one running instance. I tend to not notice it running, then open up RDCMan again. Great update makes my life much easier! with this new version, can’t Adding Servers Manually with pattern for Display name. new added by pattern have always display name same as server name. from domain and put back in WORKGROUP mode and then it will fire right up again 2-4 seconds… Anyone got any ideas on what is causing this?? It then says The file was not loaded completely. If it is saved it almost certainly means losing information. Continue? I can add servers, groups etc. without any issue – is there a size limit on my .rdg file? Only 2957kb. workaround. Will the new version of rdcman better maintained than the old one? Why can I not see my local drives in the remote desktop environment? I have enabled the drives in local resources, but can’t seem them during a session. This worked in 2.2. The lack of scaling on High DPI is a REAL problem. Could you PLEASE fix this. I would like to know is it open source software?so that anybody can install for free of cost? To remove the scroll bars on my windowed RDP connections seemed to be related to importing my old RDP connection files. 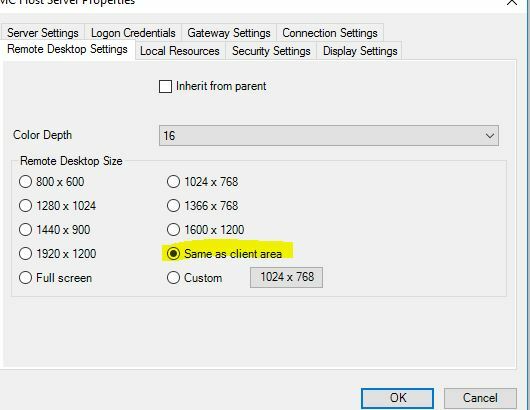 From the top of each saved tree, properties, Remote Desktop Settings, uncheck Inherit…, choose Same as client area, click OK. I have noticed that if I am sharing the .rdg file between computers, this version will not allow the password to decrypt. Even if I save it as clear text. i can in 2.2 fine. Thanks Shane, your solution works as charm!!! This tool seems potentially useful but very clumsy when attempting to enter fullscreen / undock, especially with multiple monitors. a connection undocked and in fullscreen on one monitor, it will bleed over by about 20-50 pixels onto the adjacent monitor. Hopefully this can be fixed in the next version. This release is a real regression from v2.2 . In that version DPI would scale appropriately on a high res screen but in this one it just passes through the native resolution of the monitor and is unusable. Its not possible to work with on a high DPI Monitor. A real regression as simon sad. Thank you very much, this was long overdue. When will the restricted admin mode be supported? a list of logins to diffent domains, where I use different administrative accounts. Do anyone know how to share rdg files between your computers (some 32- others 64-bits)with persinstent passwords in RDCman 2.7? Thorkild, did you ever solve the problem (of getting the error, “There were problems decrypting some credentials” when trying to share the .rdg file among multiple machines? https://blogs.technet.microsoft.com/rmilne/2014/11/19/remote-desktop-connection-manager-download-rdcman-2-7/#comment-5), but I’ve not found any reply to him. Sorry if I’ve missed it or the solution in the 200+ comments here. Why does RDCMan 2.7 only made it possible using the session menu to sign off servers that have the same saved credentials as you use to run RDCMan; why does RDCMan not just use the username which is configured for the server (mostly inherited)? I think it couldbe an option in RDCMan to password or certificate protect the rdg files for better protecting it against misuse. Certificate protection is already possible! Yeah this is America, nobody reads. Assuming the fine print was STUPID! in domain user credentials to encrypt the file. This would not work on my home machine which uses different credentials. Can RDCMan be updated to accept custom credentials? CNG attributes as described in the following article, that certificate could not be used. updated to support CNG as it’s been around since 2008 server now. Please fix the memory leak. Thanks! This is a great tool.. In remote desktop connection manger v.2.7 -> edit -> remote desktop settings tab -> click on Source: Default settings group -> select "Same as client are"
increases. Does anyone else have this problem? It’s useless because it no longer allows you to scale to a size that you can see. Is it possible to enable [Windows]-based hotkeys to remote sessions in future versions? Does anyone out there know a fix for this error when trying to connect? "Your credentials did not work: The credentials that were used to connect to (SERVER IP) did not work. Please enter new credentials." I know as a fact the domain username and password are both correct. In fact, they are saved credentials that used to work in the past. This problem came up only a few months ago. http://www.sevenforums.com/network-sharing/243121-mysterious-remote-desktop-failures.html, but not for RDG files. Ed Lewis: Thanks so much for pointing out the thumbnail interaction setting. Any chance you can add a feature to build the tree from SQL? Any chance we will get back the bulk import option? It was available via rt click drop down on the group "import" and made it easy to add a group from a text file. Hello, I have a Lenovo Yoga 2 Pro. Everything in my Remote Desktop Connection is very small. I can’t figure out how to adjust the settings to overcome the problem. I keep seeing suggestions but haven’t been able to make it work. Please help!!!!! Thanks but that does not correct the small font display regression in 2.7, at least not with 4K screens (Windows 7 and 8.x). Is there something else that you need Alex above the license agreement displayed when you install it? Rhoderick, oh, sorry, my fault. You are right, license agreement is one of the installation step. this could be done via the Options menu. Nice tool In principle but buggy! For some reason in my current environment when connecting to some servers it takes a while (a couple of minutes) for the keyboard to become active mouse works fine! think I don’t have to spend much. Man on my own workstation / Win 7 with mstsc.exe version 6.3.9600. Has anyone else encountered this? for syncing settings. I recommend staying with v2.2 for practical situations. hi How can I see encrypted passwords. I have problems with the speed of starting Remote Desktop Connection Manager v2.7. It starting very slow, it takes about 30 seconds before the screen is showing. The server where it is starting has no internet connection and it is a member of a domain. Are there any plans to make the source code available for this tool? how do we ask for feature requests or changes? so – apparently it’s not important to anyone to be able to full-screen their clients?? Tried everything… going back to previous version – 2.2. Just like Microsoft – each version GOES BACKWARDS. The BEST tool for Remote Desktop!! Error Reading RDCMan configuration file. Error loading configuratio file. Invalid IL. (C:WindowsMicrosoft.NETFramework64v4.0.30319Configmachine.config) The Program may not be unstable and/or not fully functional. How can i fix this?! cause my local mouse to move. Any thoughts on this? it’s worth). I tried a repair install from Programs and Features, but got the same results. Same with uninstall/reinstall. I’m baffled as to why I am seeing failure on two machines even though nobody else seems to be. Tried installing it on one of the machines using the built-in Administrator account, which made no difference. On the same machine I just installed version 2.2 without issue. in the Programs menu. The combination of the two made me think it wasn’t installed. I suppose I’m the only one who didn’t know this. We use the smart card login method but to enable it you have to have a TS gatway server which we don’t use. RDCM is now nothing more than a repository of server names because of this requirement. Windows 10 breaks the custom client size setting – I’m always getting a remote session with my full screen resolution. Can somebody confirm or fix this? it is a major pain in the backside. I have to uninstall and go back to 2.2. This "Session" Menu Bar is significantly afftecting my productivity and is just too frustrating. I just wish I could make the server tree a floating window on one of my additional monitors. Then this would be absolutely perfect. to save anything. Is that a design flaw? To me, I should be able to save my settings if I have 3 or 4 RDCs whether I have a group or not. Don’t you? I have the same question/request like Anton and Christopher: can we bypass pre-authentication (NLA) and add "enablecredsspsuport" to the RDCMan config? I can’t undock in 2.7. I get the following exception. – information of the remote computers being on or off (network reachable or not). – scheduler integrated with outlook to let users book for a computers time slot. We’re using RDCMan on UHD-Laptops with a Windows scaling of 200%. For this reason we cannot use RDCMan 2.7 because the content of the client window cannot be scaled and is much too small. for Remoting to Server 2012R2. So far this has worked through every build of windows 10 elegantly until now. Any ideas or fixes anyone know of? Scratch above comment. If you undock, then dock the server 2012R2 session, it goes back to a working state. before logging on for the first time". After it, I was able to log on and change password using RDP client. Remote Desktop Connection Manager should support it. Can you add 1password and lastpass support too? I’m getting old and can’t remember these things anymore……. client and it continue to run.is it a bugs? Where can I find support or report a bug? With Windows 10 1511, scrolling etc. very slow. Julian, this is a great tool! Thanks so much! The only thing that this tool can’t be used for is copying and pasting files from to and from the local desktop to a RDP session. Can you add this feature? At work we use RDMan to logon to all our servers.. great product. However, when we all use the same RDG file, if one person makes a change and then another saves after the change has been saved, it is gone. Is there a way to share the RDG file so that all modifications made are kept? Thanks for this! I have been a long time user of version 2.2 for years. Needed this version to work with Server 2012 R2 after some updates. Any ongoing plan for a new release of RDCman? app window, all is good, but only for that one connection and only for the current session. Has anybody else seen this? Thanks a lot Julian and David!!! I’m seeing the same issue with Windows 10 Build 1511 as Joe. Any update coming soon to address this? on the machine. some of my RDG shortcuts cause 2.2 to open, others 2.7. Any advice without nuking all my 2.2 config files? Windows 10 issue when I try to Undock.. is there a solution for this? Any chance of this going open source so we can contribute to its improvement? Only issue I have with RDC 2.7 is that when using the clipboard feature in local resources. It will sometimes randomly copy something to the server as soon as the mouse goes back into the server window or if you right click anywhere. Choose "Same as client area"
Is it just me or does the jump list (from pinned TaskBar icon) not work properly? Sadly on Windows 8 and Windows 10 the undock feature doesn’t work for me! Uh.. Great toll! Re-installing here and I cant find the installer. Following the link above to download gives me "can not find.." 🙁 Bingle found som downloads in the bushes, but I prefer from the provider. Any hints out there? Thanks for such a great soft. I am using V2.7 on Win7x64. Is there a limitation in creating cascaded server groups ? I’ve been running this on Windows 10 x64 for some time without issue. Starting on 1-11-2016 when remoting to a Server 2012 server the display is covered in black blocks, the move when you hover your mouse over them but makes it hard to look at the screen. Same problem happens using normal RDP program but can be corrected if I disable persistent bitmap caching. Unfortunately I can’t find an option in RDCMAN to disable persistent bitmap caching. Anyone else experiencing this with server 2012 using RDCMAN or MSTSC? I recently started to have the following issue with Remote Desktop Connection Manager v 2.7: Every minute or so the connection is lost and then reestablished. After sniffing with Wireshark I discovered that my computer after having a nice conversation with the server suddenly sends an RST packet for unknown reasons followed immediately by SYN, SYN/ACK, ACK (tcp reconnection). I failed to find the reason so far. Does any one have an idea why RDCM suddenly drops the connection? Connecting to the same server with Remote Desktop Connection instead of RDCMan works ok.
JSKY1 I have the same issue and disabling bitmap caching for MSTSC fixes it. Reinstalled OS/RDCM, remade .rdg, etc. "There was an error saving your comment. (Please shorten the content to 3072 or less.)" S.NullReference6: Object reference not set to an instance of an object. Where can I get the old version. This is too buggie esp on windows 10. Poor resoultion, screens are not consistently sized right. Basically it stinks…. First, a big thank you to those who made RDCMan possible! I have noticed in v2.7 when adding a server, the number range option is no longer available as it was in v2.2 so to workaround this I simply renamed RDCMan.exe to RDCMan.old and used the v2.2 exe. However I lose the ability to remove servers from a group! Hello, I cannot do what I used to do before – i now have an unreadable sized font on my remote machine ! HELP ! Am connecting using a new samsung laptop to an older Dell desktop. I would also like the older version please !! I want to change the default location when you click on menu file – open. Is it possible to do that? Does it support virtual channels? Can not get them to work…. Other than that it’s a great tool thanks! any change of looking at scaling? with the new 4K laptop displays, the RD sessions are very small to see and adjusting options do not yield proper viewing results. This is great, but now I am getting destroyed by account being locked out when I mapped drives with a different password. I have about 100 servers that I connect to and it’s a pain to remember to disconnect drives. Any way to add an option to disconnect drives on logout? I have windows and Linux box’s in client place, Is there any way i can connect to Unix systems using RDCMan ?? Is 2.2 still available? 2.7 does not scale resolution connecting from a high resolution device to one that isn’t. 2.2 is the only application I’m aware of that this works on. Remote Desktop Client doesn’t work at all – you can zoom, but there’s no scroll bar, so it ends up being unusable. This is a wonderful tool and I use it all the time. Thank you so much. This is a great tool. However I did find an issue that is a little annoying. When creating a “smart group” you have to create it at level 2 for the filter to work. As soon as you move it to level 3 it does not display the filtered servers. The reason for the level 3 move was to be able to create a level 2 that has the login credentials that I want. My level 1 has the overall defaults. I was looking at smart groups to not have to define a server in multiple places as I need to connect to the same server with different roles. Will restricted admin mode work in this? If not now, will you enable support for it in an upcoming update? Has anybody heart of a 2 minute timeout and logoff while using this tool? Lost my rdg file. Guess I should have read all the other crap below the download button. Can you have multiple users/admins on the same channel, or would you have to log out to allow other users/admins to gain the same access that you had, and see what you see? I love using Remote Desktop Connection Manager 2.7, but I am a Lefty and when I connect to one of my servers, the buttons reverse. I’m not the only one that connects to these servers, so I can’t go in an swap the mouse buttons on all 15 servers that We connect to. Biggest pain is in that I use a Surface Pro 4 and the stylus becomes almost useless in a remote session. I have to go find a USB mouse to get anything done. Is there an easy way to address this? Is it true that this won’t work with 64bit Win7? The edit button to add servers is greyed out. I don’t have the ability to save my connections. I can create on from the Session > Connect To – but when I close the program that connection is gone. Not even retained in Recent connection. Create a new sub-group in your group and add new server record in. Why not making it open source, so people can modify and enhance it? I would love to be able to undock THE TREE, so you can put it on one screen and have full screen RDP sessions on another screen and easily switch between them. And of course the bug within the current undock feature should be fixed asap. In the previous versions we were able to manipulate the systems we were connected to via the thumbnail. It was very handy to be able to click the same button in all servers I was connected to in one screen of thumbnails. With the new version (v2.7) nothing happens when you click inside the thumbnails now! Is there a fix for this to make it happen again? Am I missing a setting somewhere? add support for enablecredsspsupport:i:0 would be really helpful! my environment has been plagued with show RDP connections on all 3 of our domains, this wasn’t an issue when we were on server 2003, but it’s there on all 2008 servers, for context, in out “test & Dev” environment; we’re not using the same GPOs.. and I don’t get this slow RDP on initial connect issue like I do in production. adding this option “enablecredsspsupport:i:0” to the RDP file seems to have fix this issue! too bad I have 150+ servers… I need this option in RDP manager. * Data of the Remote Desktop Support being on or off (system reachable or not). * Scheduler incorporated with a viewpoint to give clients a chance to book for a PCs time opening. This is really a useful tool, I have been using it for years. Thank you very much! Just one small suggestion: is it possible to set caption color when connect to different server. In our environment, there are development, QA and production systems. We should be very careful when doing with production systems. so it will be very helpful if can customize caption color! Is there a 64-bit version of this tool? My virtual channels don’t work on 64-bit OS. They work fine on same OS with native Remote Desktop Connection client (mstsc.exe). 2.7 is impossible to use. The screens are tiny on Hi Res Screens and although I can try and change the options to fix it there is no where to save the changes so it just ignores your attempts. Any further on-going developments to maintain this tool ? A good enhancement would be to password-protect the .rdg file at opening …. Since DWM exits with error, the user is presented a login screen. Smart card logon is impossible with RDCMan and this also happens on v 2.2. Normal mstsc.exe works without problems. Hi, is there a way to Display the Server-Comments in ToolTip when hoover? I want to use the the RDG file with profile passwords on another computer. I am not clear as to the step by step procedure to accomplish this. Christmas is comming up and Windows 10 and Windows Server 2016 is out. Time for an updated version? Then would be nice is the error displayed when something goes wrong are displayed in natual english. Like the mstsc.exe does. When using smart card, the “Username hint” field of logon credentials dialog should be populated according to the username that is saved in the profile of the connection. In the same way as the username field of the logon credentials dialog is set on password logon with NLA. My LOCAL PC (Win10) was logged off immediately with “force”-option, so nothing was saved and I lost all my unsaved work and multiple running VMware sessions were just killed! Where should I report this? I am unable to share my .RDG between multiple PC’s there a way to do this now? Where can I find previous versions of the program? Can this tool auto open an rdg file when I start it up every day? Because I have a lot of Servers I administer, Remote Desktop Connection Manager is my tool of choice. However, I need to resolve a problem where I get a black screen when I connect to some of our servers. After investigation, it’s something to do with bitmap caching. So, if I were using normal remote desktop connection, I could untick “Persistent Bitmap Caching” and that fixes the problem. However, with over 200 servers in my list, I can’t connect to each one and do it that way. Another suggestion is to delete the bitmap cache when you exit RDCMan C:\Users\\AppData\Local\Microsoft\Terminal Server Client\Cache – This works, but only when RDCMan is closed. So, my question is, is there a reliable way to do this? Or is it a bug? Or something that needs a feature request? When I use RDCM and go to Tools>Options>Client Area and try selecting the window size, it never changes. My RDCM is using the wrong screen resolution but every time I change it no change is made. For clarification, this is the RDCM itself not being logged into another host. I think I found a bug. I had remoted to a server and used logmein to let an outside vendor onto that machine. When I clicked back to other open servers I was connected to, I had to fight over mouse control from the user on the first server, even though he was not on the server I was on. Once I used RDP to connect to the first server and break it out of the Connection Manager, I had full mouse control of the other servers. Seems to be a very unpleasant bug. Had a VB project developed on my local pc. Copied to the exact same folder structure on the server. Later I deleted the folder on the server via RDCMan. Had the folder open also on my local pc. The folder was deleted on both the server and my local pc. Even worse, it was not in the Recycle Bin on either machines. Spooky. Very nice tool but, sadly with my new screen, I have the known crash of the “NullReferenceException” on OnSizeChanged method during an Undock command. To be clear, switching the PersonalizationDisplay to “small” (100%) from “default” (125%) fix the problem. But “small” option is too uncomfortable with my screen. So, we authenticate to our local computers using RSA tokens; however, when we try to use a remote connection we are unable to use a username and password… We are prompted for our RSA token. The only way we are able to connect is by right-clicking on the remote connection and selecting “connect as” and entering our password there. Thoughts? Like many others, I would love to see this product be open sourced, so the community could assist in its continued growth. Certainly Microsoft has good models for doing this, with all the open work they’ve been doing. I’ve tried several others (Terminals, mRemoteNG, RCDMan). But I like this for the simplicity, inheritance model and general functionality. It’s a great and helpful tool. Would it be possible to extend it a bit, so that it will do a reconnect when the window size is changing? That would be very helpful also 🙂 Thanks in advanced. This is a very usefull tool. But it does a bad job in scaling, and full sceen undocking. The unhandled exception when undocking is already in issue for while now. I prefer to have my sessions undocked and in full screen mode like a normal RDP connection. Doesn’t seem that easy. Thanks Julian Burger for a great tool and thanks Rhoderick for posting the code. I’d also like to see some of the suggestions implemented that folks have made here, in particular open-sourcing the project. However I do understand that you folks have other priories and I for one am very grateful for this well-engineered and free tool. Scaling is very small how do I fix this? I can’t believe i’m the only one who would like to see this tool be able to just use the credentials i’m logged in to windows with, instead of needing to manually put in my password. but i have never found anybody else complaining about this. yes, i get that it can be convenient to have different credentials for different groups and machines. but it can also be inconvenient to have to type in the password. we run normal accounts and priv accounts. 99% of our users don’t even know their priv passwords. they just log into a cyberark web portal with their normal account, click on their priv account, and use a drop-down menu to select the application they want to run with their priv account. RDP, SQL Management Studio, SSH, etc. so if i’m troubleshooting an app with five servers, I have to click “rdp” five times on the cyberark page. since I don’t know my priv password, even if I put RDC manager on a server, connected to that server through cyberark with my priv account, and opened RDC manager, I couldn’t connect to anything, because I can’t manually type in my priv account password, because I don’t know my priv account password. is this great application still in development? is there any github for it? I waggle (?) from this to the modern (or what they call’em now..) remote-app in Win10. The last one scales nice when working to/from a high/low-resoluion screen. But I miss the tree of connected and saved computers to switch easy between them. I can’t dock the “home” bar in the modern app. So I don’t know which one to hope for, both needs some updating to do the jobb well. Which one to go for? Nothing has happened with the “new” one for a long time. There is one thing that would be very useful. Do you think you could add option to connect to multiple monitors, but not all? A lot of people is wanting the feature and Microsoft is not adding it, so I thought you might want to try implementing it. It is November 8th, 2018. “Remote Desktop Connection Manager has stopped working” dialog. I am glad that I kept my version 2.2 installer package as this version shows no hope of ever launching correctly on my system. I’m running into a unique situation here with the RDC Manager. On the RDG File properties > Display Settings > “Scale docked remote desktop to fit window” is checked. When I do a Full Screen on the remote machine for the first time, screen display is good, font is legible and able to work with it. When I restore it down and again go back to the Full Screen mode, the display is blurry and the fonts are illegible making it hard to work. When I uncheck the “Scale docked remote desktop to fit window”, the Full Screen works well without issues as many times it’d have been restored down. But that would make the rendering in the Client Area to overflow. I’d like to have the Full Screen mode and the Client Area to show the entire remote desktop area without issues. BTW, I’m on Win 10 Enterprise with display resolution of 1920×1080. Any help would be much appreciated. I already put in a uservoice for this, but for more visibility, I’m posting it here also. Updating RDCman to use Azure Security Center JIT management would be an awesome addition to an invaluable tool. Wondering if we can add “enablecredsspsupport:i:0” in the rdg file.